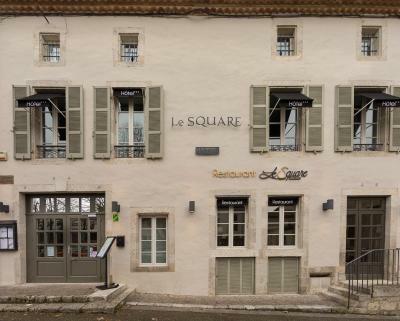 Lock in a great price for Le Square – rated 9.2 by recent guests! This is an exceptional hotel brilliant in all respects. It is likely to become famous quickly and we were fortunate to find it when it is still new - in a year or so it will be at the top of everyone’s best hotel lists. Delicious food, design and decor first class, warm and friendly owners, jacuzzi bath, delightful terraced restaurant. If it were possible to score it higher than 10 we would have done so ! Un grand lit bien confortable et une chambre bien équipée. C'est surtout le restaurant et son dîner gastronomique qui nous ont enchanté. Het restaurant is een omweg meer dan waard. Volgens ons is de kok op weg naar een Michelin ster. Onwaarschijnlijk lekker en verfijnd. Très bon accueil , chambre et cadre sympa, belle terrasse, calme, confort et propreté dans une ambiance chaleureuse . Le lieu est charmant !!! La tranquillité, la décoration de la chambre, l'accueil. Located in Astaffort, Le Square features a terrace, shared lounge and bar. This 3-star hotel has air-conditioned rooms with a private bathroom. The property provides a 24-hour front desk and free WiFi. All guest rooms in the hotel are equipped with a flat-screen TV. All rooms will provide guests with a desk and a coffee machine. A continental breakfast is available each morning at Le Square. There's an in-house restaurant, which serves French cuisine and also offers gluten-free and vegan options. Agen is 12 miles from Le Square, while Condom is 21 miles from the property. The nearest airport is Agen - La Garenne Aerodrome Airport, 11 miles from the hotel. This property also has one of the top-rated locations in Astaffort! Guests are happier about it compared to other properties in the area. When would you like to stay at Le Square? This double room has a bathrobe, satellite TV and soundproofing. This double room features a electric kettle, soundproofing and mini-bar. This double room has air conditioning, soundproofing and mini-bar. House Rules Le Square takes special requests – add in the next step! Le Square accepts these cards and reserves the right to temporarily hold an amount prior to arrival. Muy disconforme con el trato recibido. Very dissatisfied with the treatment received.